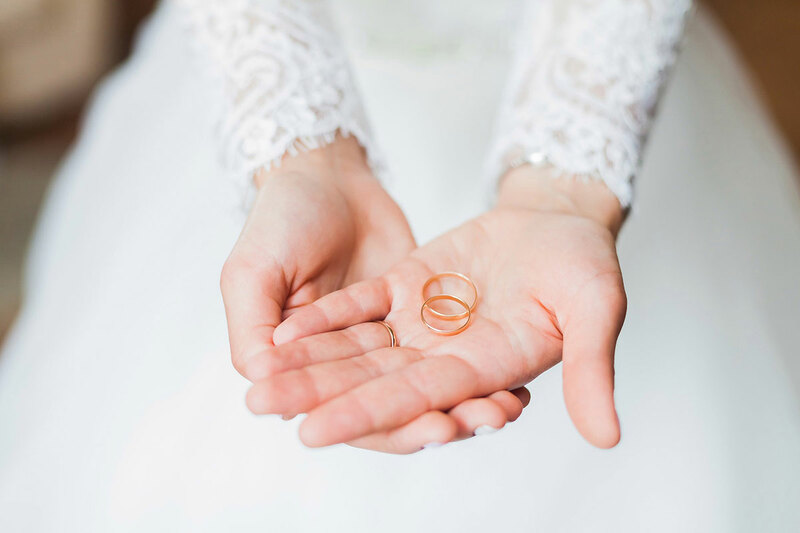 Your wedding will be the best day of your life! In order to make those memories last as long as possible, you should take as many pictures as possible on that day. Obviously, you'll take some of the ceremony and celebrations themselves, but if you like, you should definitely also take lots of photos of you as a couple. During your intimate couple shooting, you'll be able to experience that special bond between just the two of you at your wedding. Together with your photographer, you can make your personal wishes and desires come true. 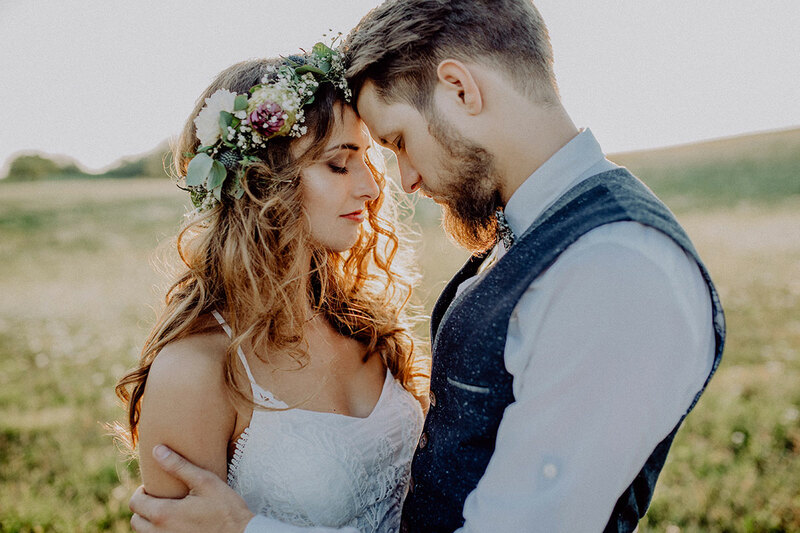 If you're still a little unsure about how these photos should actually look, we have 5 great wedding shooting ideas for you, which you can use during your shooting! 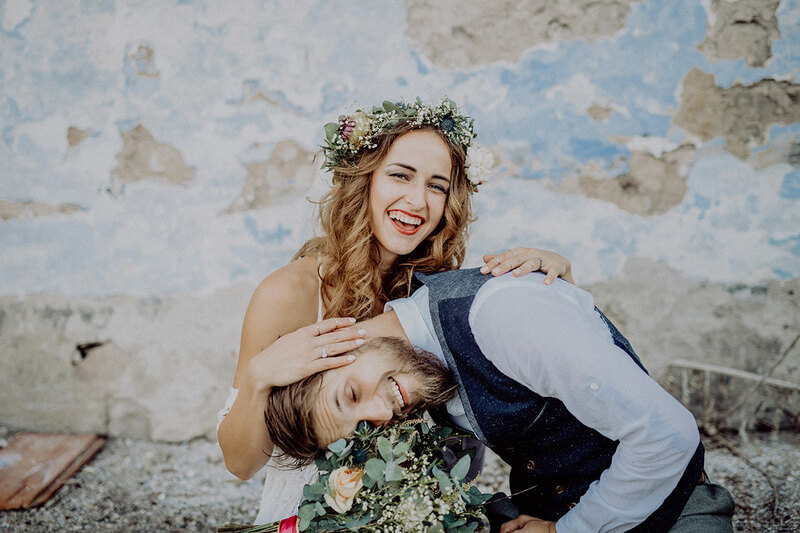 Until autumn we will give you tips on the perfect camera technology and what is best suited for wedding photography, how you can improve the mood of the pictures by editing them and where you can find the most beautiful invitations, thank-you cards and Pixum Photo Books. But firstly, we will start with five tips to create a breathtaking couple's shooting. The couple's shooting can become a haven of peace between the many other program elements and surprises on the big day. First, you should consider when the shooting should take place: A few days before the wedding, even if the surprise is gone? Of course, it is also possible to take photos a few days later, even if you may not be able to get the same hairstyle from your wedding day. If you decide to take the photos on the day of the wedding, it is important to choose the time carefully. In the morning hours there is lovely light, at noon it is rather bright and in the evening you can catch the golden hour again. In any event, make sure you allow yourselves plenty of time for the shooting, so you won't be so stressed. Once all these decisions have been made, you can decide what motives are important to you. First and foremost: It's your wedding and your shooting. Think about what suits you the most and simply do what you want, because if you feel uncomfortable with something, you will later see it in the pictures. The entire shooting is all about you and your partner, so the location should be something special. On the day of the wedding, of course, it makes sense to include the place of the celebration. Depending on how large the venue is, it can, of course, be difficult to find a quieter place. Then you might want to think about a beautiful place nearby. Ideally, it even has a personal connection to you, but remember unique photos can also be taken at any other location. Just make sure to get involved with the location and take advantage of its special features! If there are plants in sight, you can use them in the shoot! For example, the bride can smell a flower or the bridal couple can lean against trees. Are there stairs? Sit on different steps and look at each other. Perhaps there is also a great horizon there, then the photographer can capture you from behind, this gives a fantastic effect especially with backlight. In the end, there are countless possibilities and every place is unique. Just keep your eyes open and with the help of your photographer try everything out. Most people are not regularly in front of a camera and feel observed and uncomfortable during a shooting. So it's only normal if you can't get directly comfortable with the camera. But once you've decided to shoot on your wedding day, there's not much time to adjust to the new situation. Something a little silly, like the groom can carry the bride on his shoulders - it looks like his legs are hers! Ask the photographer to pay special attention to the details. You've spent a lot of time picking out the bouquet, the shoes and the rings, so let them become part of your memory. For the couple shooting, you can also take special props with you. Think about what might be right for you - something sentimental, colourful shoes or chalkboards on which you can write something special? Also ask your photographer, maybe they have some extra items in their inventory, so you don't have to worry about it yourself. You can add a personal touch by including photo prints, such as your parents' wedding photos or your children's photos. Use the pair shooting also to take a perfect picture for the thank-you cards. Therefore, it is a good idea to take a picture with a sign saying "Thank you" on it. For example, you can resume the colour scheme of the wedding with specific items in the photos. You don't have to do this, of course, because everything has to be your style. For this one photo, it's very nice to look directly into the camera, as if you would thank each guest individually by looking into their eyes. 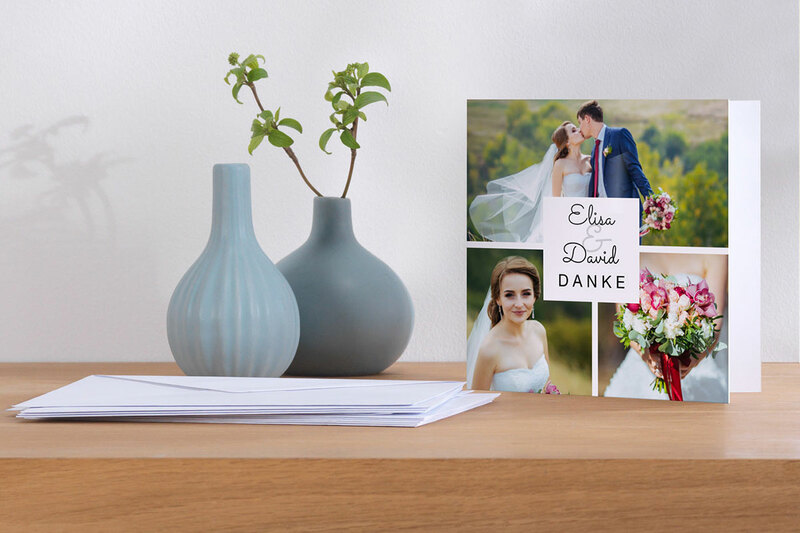 After all the organisation for the wedding celebration, there is only one decision ahead of you after the wedding: Which format should the thank-you card have? 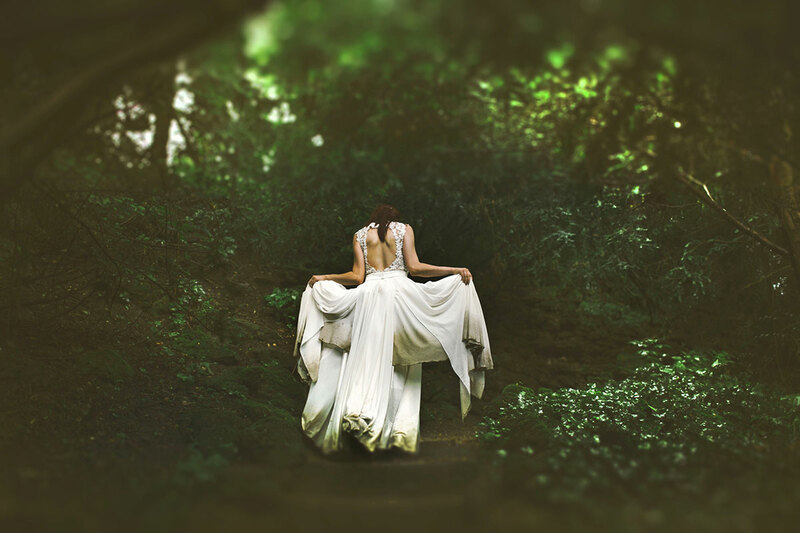 If the shooting does not take place on the wedding day, but a few days later, there are of course completely different possibilities for the photos, because the dress can then also get a little dirty. Some couples go so far that they take Destroy the Dress literally and literally destroy the dress. 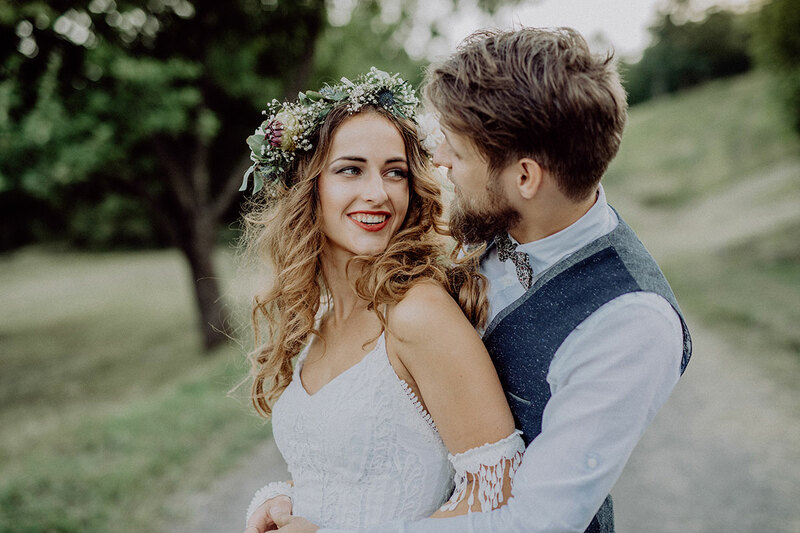 Of course, you don't have to do this, but there are still photo motives possible, after which the dress would not be suitable for weddings anymore. The colour powder you might know from the so-called Holi Festivals is great. These will wrap you in a great paint mist during the photo shoot, but the paint can easily be washed out afterwards. Another idea is water in all its forms: Spray guns, a fountain or directly the sea? Wet each other or dive in together - great photos are guaranteed! After drying your dress and suit they shouldn't be ruined too much. The most important thing remains: Be yourselves and have fun! Good preparation is not everything, also be spontaneous together with your photographer. Looking for more inspiration for your wedding? 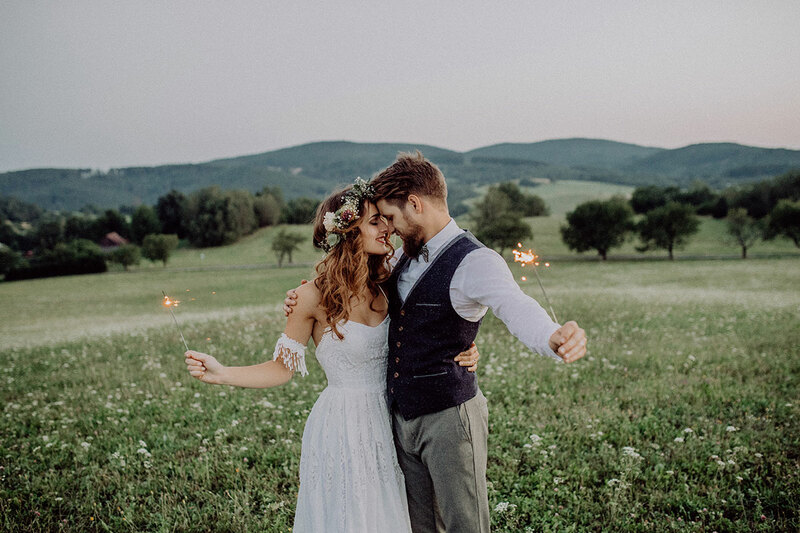 Everything from invitation cards, wedding preparations, decoration and DIY ideas can be found on our Wedding Ideas & Inspiration site. To cherish the big day forever create a premium Pixum Photo Book or a personal Wall Art that showcases the beautiful photographs. Perfection is our promise.